Lonicera x purpusii is a rather obscure member of Caprifoliaceae, the honeysuckle family. This is likely due to the woody shrubs rather unkempt demeanor. 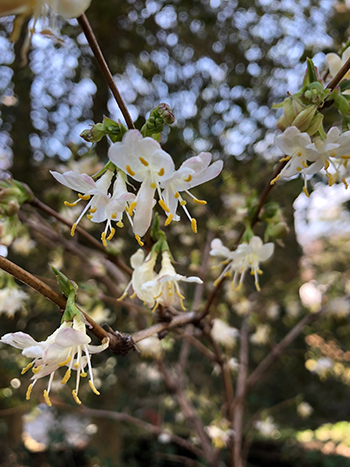 Even so, the family trait of lax growing habits shouldn’t exclude this deliciously fragrant winter bloomer from the garden.Between late February through March it is covered in clusters of white, tubular flowers with prominent yellow anthers. Unlike many of its relatives, Lonicera x purpusii grows as a bush, rather than a climber. It has an arching habit and will grow about five feet tall, with a spread of approximately six feet across. It can be pruned after flowering, but it will look its best if its branches are thinned by up to a third rather than cut back. It prefers sun or semi-shade in well-drained soil. Lonicera x purpusii is a cross between Lonicera fragrantissima and Lonicera standishii, produced in the 1920s in Darmstadt Botanic Garden in Germany. The species name pays tribute to two German brothers: Carl Albert Purpus and Joseph Anton Purpus. Together they collected plants from Mexico and the western United States. 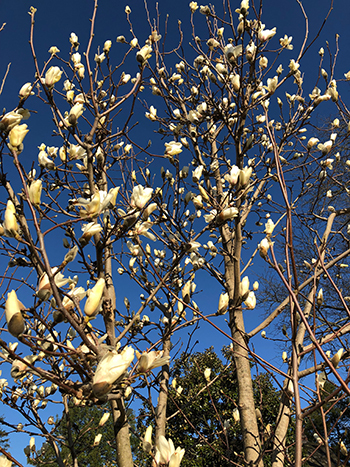 The Yulan magnolia, Magnolia denudata, is a small tree typically reaching 30’ – 40’ tall with fragrant goblet-shaped white flowers that emerge before the leaves unfurl. The specific epithet meaning “bare” or “naked” alludes to this characteristic. While this trait provides for a spectacular floral display, it does put it at risk from spring frost damage. 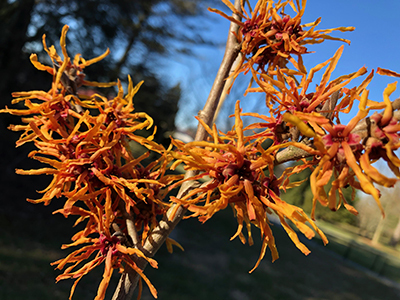 While there is a multitude of information pertaining to Hamamelis x intermedia and the numerous cultivars that have resulted from the crosses between H. mollis and H. japonica, there is little information regarding the cultivar ‘Arnhem’. Located in the eastern part of the Netherlands, Arnhem is the capital of the province of Gelderland and is located on both banks of the rivers Nederrijn and Sint-Jansbeek.